This classic 3 reel pokie, that has a single payline, comes from the Microgaming developer, who are the recognised leaders in this type of game. It’s got some nice graphics, an unusual theme and an equally unusual way of collecting wins, with all prizes paid out in a side game to keep players engaged. Set in the less-than-exciting environment of a newsagents that seems to be stuck in the 1970’s, players will mostly see old-fashioned symbols as well. But it’s brought up to date with a bonus game where players get to pick scratchcards for some potentially big wins, while nudges and holds which give players extra chances to line up a winning combination are also featured. A dusty old newsagents’ shopfront serves as the backdrop to this pokie, which doesn’t make it the most exciting game to look at, but we’ll ignore that for the time being and look at how the rest of it shapes up. The screen seems fairly cluttered at first, with the nudge game down one side, the reels in the middle and a payout table running up the right side. Below them is a simple set of buttons used to adjust bet sizes from as little as 0.10 to as much as 10.00, which means that this is a game for more casual players rather than serious punters looking to make some huge wins. Having said that, there are still some decent payouts to be had with a jackpot of 1,000x the bet waiting to be claimed, although all winnings are to be had when playing the scratchcards, as lining up symbols on the reels only awards extra cards, not actual winnings. The paytable details how many cards are won each time matching symbols line up across the line, with cherries earning 2 cards, lemons are worth 3, oranges reward 5 cards, there’s 7 cards to play when the bar symbol lands across the line, while blue 7’s are worth 10 cards and red 7’s are worth 15 of them. 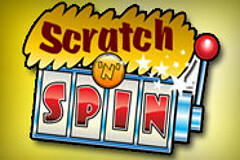 Lastly, landing the Scratch ‘n’ Spin logo across the line means that players get 15 cards. The real action takes place once players are invited to step inside the shop, where the owner, who looks much like Granville in the popular British sitcom Open All Hours, will present 6 scratchcards to them. Each one has a different theme and design, with everything from aliens to Vegas covered, and players get to scratch them in turn to hopefully reveal prizes, although some of them are losing cards. Wins range from 10x the bet to 1,000x and overall there’s a decent return to player ratio that means more winners than losers should appear, it’s just the frequency with which the round is triggered that gives the casino that all-important edge to keep them in business. To help give players a bit more of a fighting chance there’s nudges and holds randomly awarded. Nudges give players the ability to move reels up or down a notch and they can be gambled or banked for another time if needed, while holds are self-explanatory, with players able to hold a reel in place while the others spin again. This pokie is a bit of an oddity, with a strange theme and an unusual way to create wins. By not having any real payouts in the main part of the game, players just collect extra cards and have to keep popping in and out of the newsagents to claim any wins. It's not really a bad setup, just odd. An old-style shop isn’t the most exciting of places to base a pokie either, but those players who like to remember the days when these were around could find some nostalgic charm here.